While it were the Arabs and the Turks who brought coffee to the European continent, it are definitely the Italians who made coffee drinking an art. It was also probably via the italian word caffè (from the Ottoman Turkish pronunciation Kahveh of the Arabic qahwah) that the word entered English around 1600. 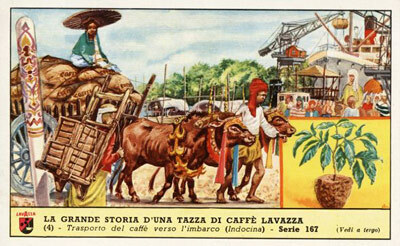 "La Grande Storia di una tazza di caffé Lavazza"
Italians prefer Arabica over Robusta blends, because of their richer flavor and lower coffein content. 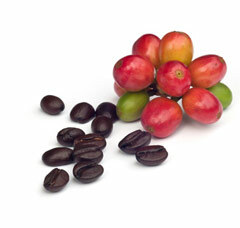 The coffee beans are also roasted and grinded in a typical way to confer the coffee its typical crema. 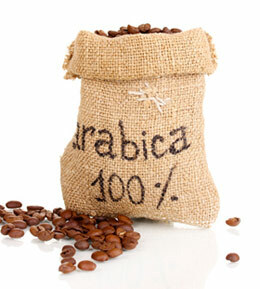 Many of the famous historic coffee houses produce their own Arabica blend, which gives their coffee a unique taste and quality. Although most Italians drink their coffee in a minute or two, usually at the local bar, not even taking the time to sit down, they take their coffee very seriously. Like many other Italian traditions, Italian coffee is an art form where customs, rules and savoir-faire play an important role. There is a type of coffee for every time and occasion of the day. 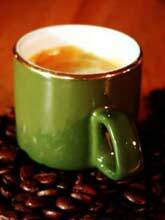 Cappuccino is usually consumed only in the morning (until 11:00) and never after a meal. In a cafe, different prices are charged if you consume your coffee standing at the bar or sitting down at a table or on the terrace, and the difference may be surprisingly high depending on the importance of the place. Many foreigners think that Italian cafes make you pay for your coffee before you go to the bar to get served, in order to make sure that no one leaves without paying. I prefer to say that it is because the art of preparing a true italian coffee requires a real expertise that has nothing to do with the skills expected from a cashier. The caffé, both the beverage and the place where you consume it, form an integral part of the italian culture. Without exaggerating one may say that the art of preparing and drinking coffee in Italy is comparable to the tee ceremony in Japan, although it is not as time-consuming an activity, as Italians are always in a hurry. Photo credits (from top to bottom): cup of coffee © P. Ramakers im-visions.com; coffee beans © tropper2000/Fotolia.com; Arabica coffee © Africa Studio/Fotolia.com.